I have previously used Drive Image on my win2000/xp machines. What I have always done is put an image on the internal HDD, differet partition, and restored from there. This can usually be done in a few minutes after booting into caldera dos. But of course DI will not work with ntfs.I find this method extremely useful after modifying/trying out new programs/problems etc etc. Will Macrium allow me to restore my win 7 machine in the same way. Unfortunately my C drive is about 13Gb which I find, contrary to what a lot of peope think, much too big. I do not want to wait an hour or so to restore - my DI solution on my desktops, which have C drives <3Gb, mean't I was never down for more than 5-10 minutes max. I alternate. Every second image goes to a partition on an internal HDD, then the next one to an external disk. 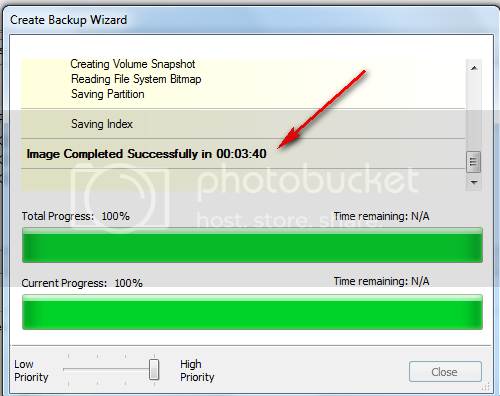 The image I took this morning from my Win7 C: ( 13.2GB used) took 3.40 minutes. A restore from the external disk took 20 minutes (have not yet tried from the HDD). And that was without prior image verification. With verification, the time doubles. I used Macrium on Vista, but now use 7's options. No point installing extra software when Windows does everything you need. So I can restore from the internal HDD directly - If so does it do this by installing its own dos, like drive image when booting up ? How big would an approx 13Gb C drive compress to and can this be made into 1 bootable DVD ? You can restore from an internal HDD provided it is from a different partition, better even different physical drive. An image of a 13GB OS footprint is a little over 6GB (which would not fit on a DVD). But the recue CD fits on a cd or DVD. You should burn that first because else you cannot recover. With all do respect, you sure brushed by the making of the the Recovery Disk. I just went through the process and they gave two options: Linux and BartPE. In Bart PE they mention XP which i was using to make an Image. I had no idea what BARTPE was all about, so I used the Linux option. After reading i have some idea about BART, the fellow said it took 2 days to make a BART disc. No thanks. Use the Linux version. It works. I recoverd several times already with it - just for testing. Thanks very much.. did you test the linux ver. with XP? The reason I ask because in Bart they mention " if you are using XP" ... just a little confusing. I tested with Win7 and Vista. Not XP (I have no XP), sorry. But why don't you test it if you have XP and report back. valued suggestion, only problem i could lose my data . I'll wait till I have to do a reload of XP . I used it for my Win 7 computer so your info has been encouraging, thanks again.